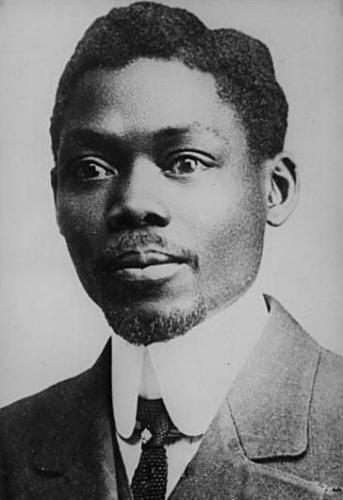 Galaye M’baye Diagne, the first African elected at the French National Assembly and to obtain a post in the French government, was born on October 13, 1872, on Gorée Island, Senegal. His father, Niokhor Diagne, was a cook, and his mother, Gnagna Anthony Preira, a servant. While still very young, Diagne was placed in various Métis (mixed race) families, and finally adopted by a wealthy Christian Métis, Adolphe Crespin, who renamed him Blaise. Crespin sent him to the Brother of Ploemel School for his primary education. A brilliant pupil, Diagne pursued his secondary education in Aix-en-Provence, France. He passed the French Customs Service entrance examination in Senegal in 1891. As a customs agent, Diagne was assigned throughout the French empire. His first post in 1892 was in Dahomey. Between 1896 and 1914 he served in Dakar, the French Congo, the island of Reunion, Madagascar, and finally French Guyana. Diagne often criticized oppression and discrimination of the black population in the colonies during his career as a customs agent. After returning to Senegal by 1914, Diagne immediately got involved in politics and ran for a seat in the French National Assembly in Paris. Campaigning for African rights and improved work conditions, Diagne defeated the Métis attorney François Carpot on May 10, 1914. As a deputy during World War I, he sponsored a law which gave full French citizenship to the inhabitants of the Four Communes (four coastal communities) of Senegal. The measure, which also included the thousands of African men then fighting in Northeastern France against the invading German Army, passed in 1916. In the same year French Prime Minister Clémenceau nominated Diagne to be General Governor for recruitment of soldiers in French West Africa. Diagne accepted the post after negotiating guaranties concerning soldiers’ conditions. In 1919, Blaise Diagne created the Republican Socialist Party, which won control of local governments in the Four Communes of Senegal. Diagne became the leading political figure in the Four Communes. He also founded a newspaper called La Démocratie and later renamed L’Ouest Africain Français. By 1923, Diagne concluded a commercial agreement with French firms that held Senegalese business. Diagne also defended forced labor and assimilation before the International Labor Organization in 1930 and was, later on in 1931, appointed Deputy Minister of the Colonies in the French government. By this point he had become a stanch supporter of French rule in West Africa. Constantly reelected Deputy at the French Assembly, Diagne died of tuberculosis on May 11, 1934, at Cambo-les-Bains, in the French Pyrénnées Mountains. “Diagne, Blaise (1872?-1934),” in Kwame Anthony Appiah and Henry Louis Gates, Jr., eds., Africana: the Encyclopedia of the African & African American Experience (New York: Oxford University Press, 2005); Amady Aldy Dieng, Blaise Diagne: député noir de l’Afrique (Paris: Editions Chaka, 1990); “Diagne, Gueye, and Politics of Senegal, 1920s and 1930s,” in Kevin Shillington, ed., Encyclopedia of African History (New York: Fitzroy Dearborn, 2005). (New York: Fitzroy Dearborn, 2005).